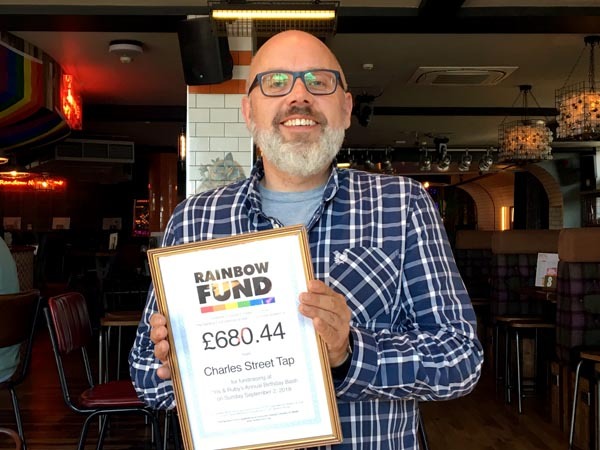 Rupert Ellick and Chris Marshall, general manager of Charles Street Tap, celebrated their combined birthdays on Sunday, September 2 to raise money for the Rainbow Fund. CHRIS Marshall (pictured) accepts a certificate of thanks from the Rainbow Fund. Artists donating their time on the evening included Lola Lasagne, Davina Sparkle, Drag With No Name, Jennie Castell, Lady Imelda, Rose Garden, Sandra, Heart & Soul, Sally Vate, Miss Disney, Jason Thorpe, Joss O’Brart, Lucinda Lashes, Cinebra, Spice, Mrs Moore, Kara Van Park and Pat Clutcher. The Rainbow Fund make grants to local LGBT/HIV organisations delivering effective front line services to LGBT+ people in Brighton and Hove. 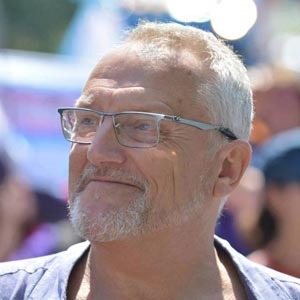 Through an independent grants panel, the fund give grants to LGBT/HIV organisations in Brighton & Hove who deliver effective front line services to LGBT+ people in the city. In the 2017-18 grants round the following organisations benefitted from grants amounting to £110.688: These included Allsorts Youth Project (£5,000), Brighton Gems (£1,725), The Clare Project (£5,000), The Rainbow Chorus (£7,150), Older & Out (£5,270), Sussex Beacon (£7,500), Accessibility Matters (£1,800), Whitehawk LGBT support group (£1,000), Trans Alliance (£5,000), Peer Action (£7,300), Lunch Positive (£8,082), MindOut (£14,989), Switchboard (£11,725), and LGBT Community Safety Forum (£29,147). Successful groups/organisations receiving money in the 2018-19 grants round will be announced at The Rainbow Fund LGBT+ community grants presentation evening at The Hilton Brighton Metropole on Monday, October 15, at 7pm which will be hosted by comedian and Rainbow Fund Patron Zoe Lyons and Lola Lasagne. If you’d like to be on the guest list please contact the Rainbow Fund via the “contact us” button on the website at www.rainbow-fund.org. Places will be allocated on a first come first served basis, and people will be contacted on Wednesday, October 10 to let them know if they are on the VIP list.